Making a game is rarely a straightforward process, and if so either the maker did not care enough about it and the result will not be so good or the maker travels in time. We had several instances of adding/removing features and god it won’t end today, here are some features we liked that had to be pushed away because they finally did not blend well with our goals. Fast dashes are great, right? Yeah they are great and they feel great, and the faster they are the more awesome they are. But as dashing is a MAJOR part of Toto Temple’s navigation and not everybody have superman’s reflexes and control, the fast and “impressive” dash action of the totos was maybe a little bit too challenging. It was a wild, untamed, crazily fast steed, the timing was really really hard to master and quite stress inducing. So we reduced the speed of a dash and made the speed constant, removing some visual “wow” factor and impact to enhance gameplay. 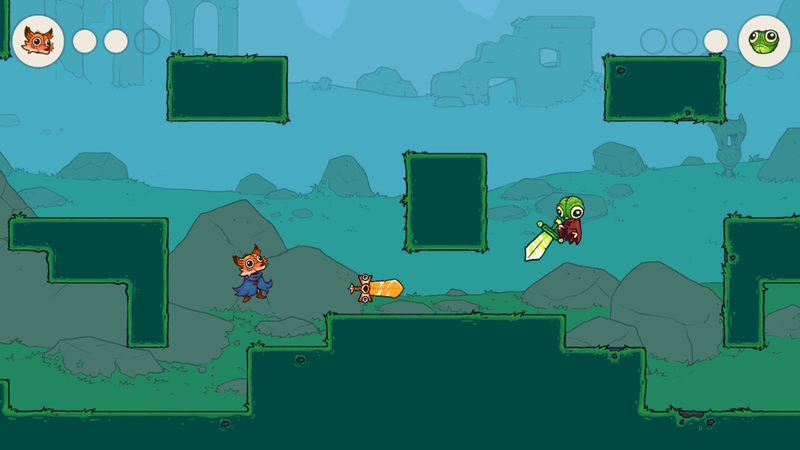 In the beginning, players could dash and interact with each other, giving place to little funny scenarios where each could hinder the actions of the other. 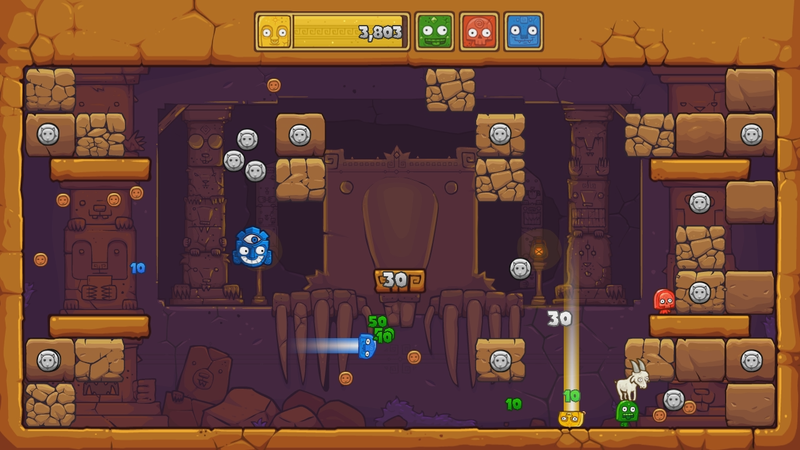 It also gave tools to broaden the experience and let players choose their play style. We removed it. In addition to have fast dashes, a dash could sometimes not behave as expected, either stopping as soon as it started without the consent or acknowledgement of the player because you hit another player or going farther because you missed the target. Add the fact that you take very little space in the screen and there is lots of visual noise and you lose your character quite often. This is due to your eyes looking where you expect to be, then there may be a toto passing by, and your eye hooks to it then, after a while (because both your and your opponent’s goal would be the same: get the goat), notice it doesn’t do at all what you want it to do, then you look for your own self in the screen. Also, as the players were clustering around the goat carrier, it became more and more difficult to navigate and instead of simp;ly navigating it became more of a non-responsive button-mash fest. So we removed the collisions between totos that don’t have the goat, this had the effect of sacrificing little funny interactions between players, hindering one another intentionally, in favor of removing confusion when you hit others you did not intend to hit. Note: since the original game did not allow you to navigate freely in dash mode and go back and forth indefinitely, the original version did not have this clogging problem. But we wanted the players to be in total control of his actions, removing navigation rules. Tightening controls meant clustering players around the goat, bringing all this confusion along, with the problem being a symptom of a new design decision, of course we had to adjust in consequence. Clusters like this are not rare and, as said before, they are caused by the fact that there is only one main goal, we also don’t have any “purge” system. If you take normal 4vs4 brawlers, usually, each character has a limited number of lives then they disappear, removing some confusion and stress on the way, like in Starwhal, or Super Smash in which the time it takes for a player to come back to the brawling area after beign launched counts as a purge time. Even better, in Samurai Gunn or Towerfall this purge happens with every landed strike: the character dies or respawns somewhere else or not at all, leaving the area around you clear from his presence. Purges make occurences of 4 characters shuffling about in the same area last really short time if there is any. We noticed a correlation between the confusing moments and the moments that the goat is stolen really rapidly. 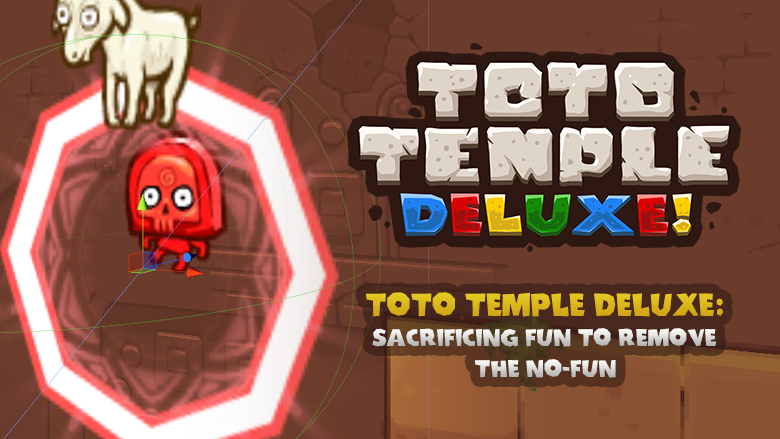 As making a lives or respawn system goes against Toto Temple ideology, we decided to make the totos blow away from the new owner of the goat when it is stolen, clearing the area for half a moment, separating the totos that were compacted in the area and making the players focus on only their character. You can see the repelling blast wipe away every Toto near the new goat carrier, leaving him time to escape and removing confusion by giving a moment of respite to everyone and separating them. We’re talking about the development of one title here, but several conclusions we draw and the reasoning behind them can be applied on many games and designs. So I hope, if devs or aspiring devs read this, I can help them elaborate stronger mechanisms for their own game or give them clues on easily overlooked parts of a mechanism like the ease of assimilation/understanding and interactivity/chemistry between elements for a good feel. These are always tough decisions … great work, can’t wait to play it !!! I’m new in game development and I wanted to create a simple game. Where do I start learning? Yup! You can see the previous entries, it talks about overcoming some of Unity’s shortcomings. as up adobe flash animations to unity? swf, sprite images or other file (adobe flash) ? Tell me if I don’t answer correctly, I’m not sure I understand the question. We use Adobe Flash to make animations, may they be drawn frame by frame or even some movement and tween animations. We then use some tool I’ve made to export these frame by frame and movement animations, then we include them in the project. The frame by frame animations are handled with Toolkit2D an asset in Unity’s asset store, really useful. The movement animations are interpreted by some timeline player I’ve made, it uses Toolkit2D as well.